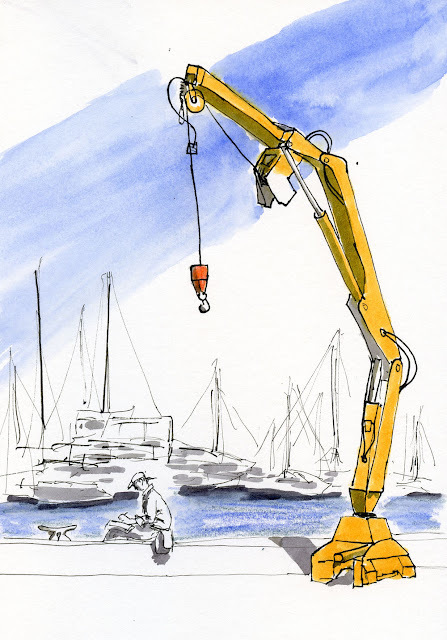 Urban Sketchers Seattle: Happy 7th Anniversary, USk Seattle! Happy 7th Anniversary, USk Seattle! 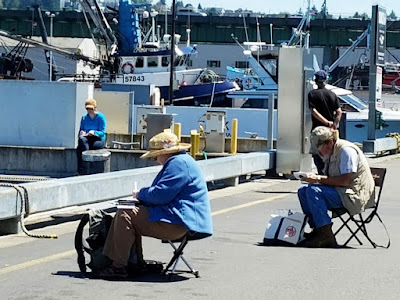 Just a couple of weeks shy of our seventh anniversary, Urban Sketchers Seattle met this morning at Fishermen’s Terminal, the site of the group’s very first sketch outing in 2009. I, myself, would not join USk for another three years, but in many ways I feel like I’ve been part of it all along, watching it grow in both members and enthusiasm. 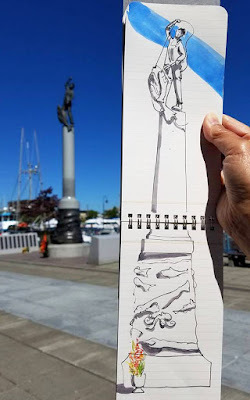 Starting up shortly after Gabi Campanario founded our international parent group Urban Sketchers, USk Seattle was one of the first regional chapters to form. We’ve been meeting on monthly Sundays ever since, and in 2012 we began meeting additionally twice a month on Fridays. 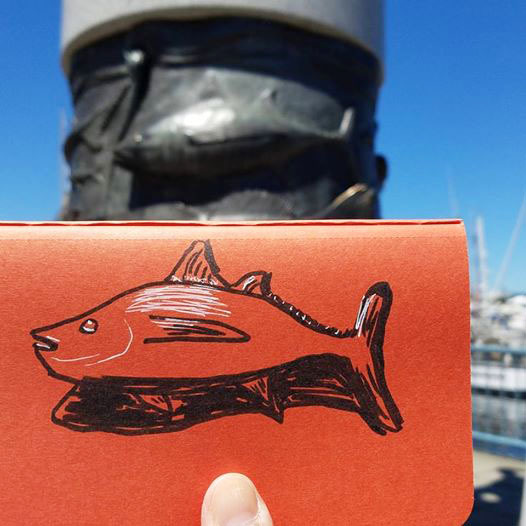 Last year at the terminal, I focused on the boats, but it had been a couple of years since I sketched the Seattle Fishermen’s Memorial, a tribute to the people who have died at sea as part of the region’s fishing industry (below). With that in mind, I remembered to bring along my Field Notes Byline reporter’s notebook, whose long, skinny format is just right for tall, skinny memorials. In the small red Field Notes is a detail of one of the many fish at the foot of the sculpture. As I walked along the pier, thinking I would sketch one of the gazillions of boats, what should I find? One of my favorite subjects, a bright yellow crane! And just beneath it was Frank Ching, whom I knew wouldn’t be there for too long, so I sketched him first (top of page). On this sunny morning when it felt like summer had finally returned again (after three weeks of a wet and chilly June-uary), we were out at Fishermen’s Terminal in nearly record-breaking numbers – someone counted 38! (I think our record is nearly 50 on an equally beautiful day at Pike Place Market a couple of summers ago.) Happy seventh anniversary, USk Seattle! I’m proud and honored to be a member! Love the one of Frank! I saw you drawing the fish. Pretty impressive sketching while standing!